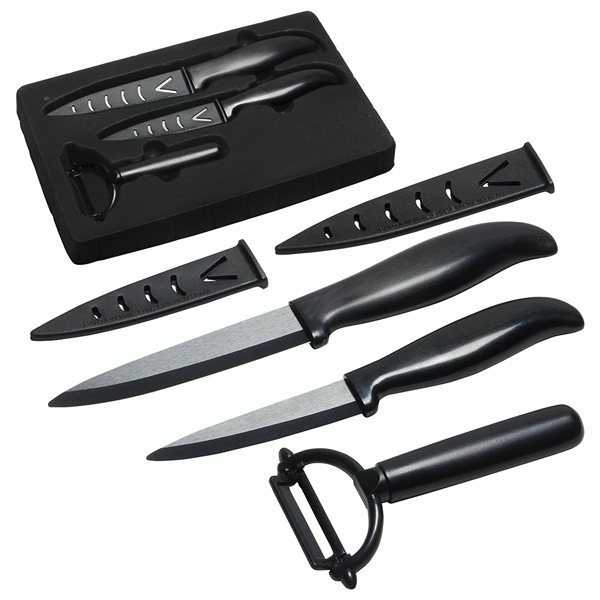 Finely crafted with extremely sharp ceramic gunmetal blades. Three piece set contains the following:. 9-1/2" knife with 4-3/4" ceramic blade and protective sheath. 8-1/4" knife with 3-7/8" ceramic blade and protective sheath. 5-3/8" peeler with ceramic cutting blade. It is a well-designed product that I will enjoy giving out to my alumni group. I like that my logo turned out well (designing it was the challenge) It has an easy grip and the colors available are quirky and fun. The design itself is quite cute. Price could have been a little better. Compared to others it was ok.
they were a big hit. Great, low cost promotional item. Large area for displaying logo, phone number, etc. there was nothing I disliked about either product!